The Christmas season is a magical time in any destination. Everyone is cheerful, everything is sparkling and everywhere you look there’s something to do or see. From ice skating, skiing and sleigh rides to sand sculptures, light shows and Christmas markets, the holiday season is full of festive ways to escape, near and far. 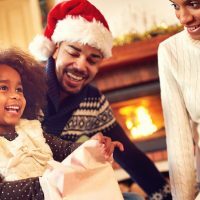 So, if you’ve tired of tradition or want something extra special for this holiday season, try one of these great Christmas family vacations. 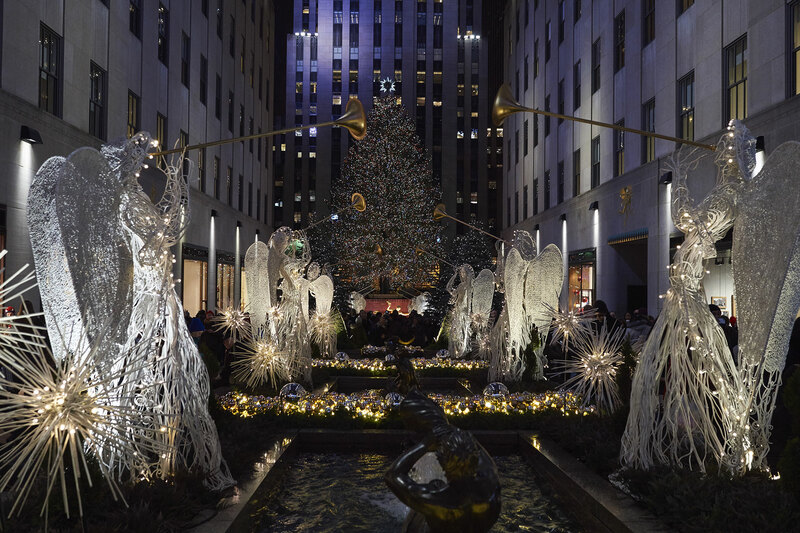 It’s true — there’s no better place to spend Christmas than New York City! The city is even more magical during the holiday season. 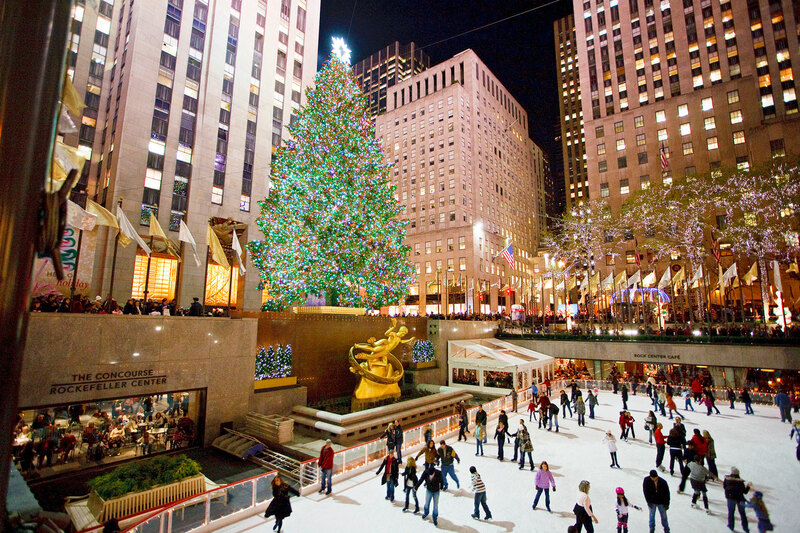 There is ice skating at Bryant Park and Central Park (and other parks across the city); the famous Christmas tree lighting at Rockefeller Center; and the Rockettes at the Radio City Christmas Spectacular Show. The department store windows come to life with over-the-top festive scenes, as well. There are light shows all over the city and carolers singing, and Santa seems to be around every corner. The holiday season kicks off with the famous Macy’s Thanksgiving Day Parade and comes to a grand finale when the New Year’s Eve ball drops in Times Square. The Ozark Mountains of Branson, Missouri, put on quite the Christmas show for families of all ages. Branson gets in the Christmas spirit with numerous live singing and dancing performances, parades, Christmas light shows and tours, where families can drive through hundreds of light displays. There is even a Christmas Tree Trail where giant trees are decorated and on display throughout Branson. You won’t find any Charlie Brown trees here! But it is at Silver Dollar City that families will discover the true meaning of Christmas in the Ozarks. An Old Time Christmas at Silver Dollar City (from early November through January 1) is one of the most magical Christmas festivals in the nation. The entire park — every inch of it — is lit with millions of lights (assembling them begins in October!) and there is a five-story special effects Christmas tree in the center of the park. Head to Branson before December 25 and get some shopping done, too. The handcrafted goods, such as pottery and blown glass at Silver Dollar City, make excellent and unique gifts. Branson Landing and the outlet center are also great for holiday shopping. European Christmas markets are especially fun for Christmas family vacations. 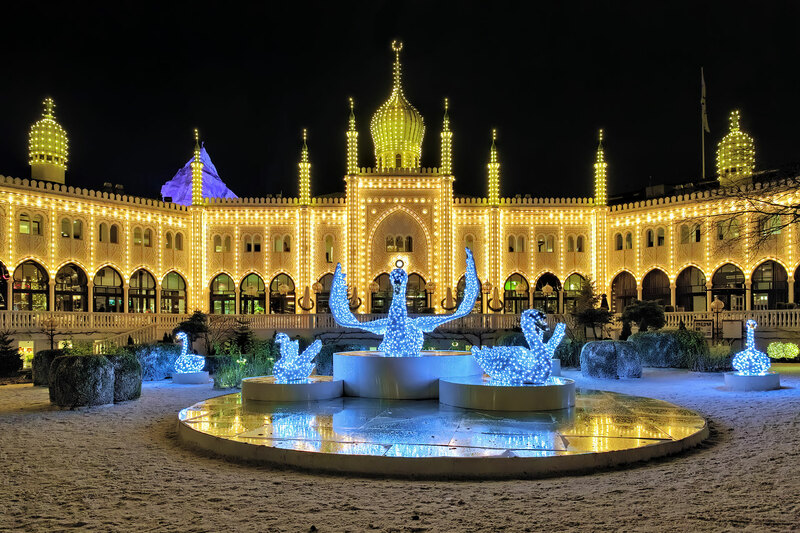 But Copenhagen’s Tivoli Gardens is the number one Christmas must in the city, and the locals can’t get enough of the tradition. Decorations, gift ideas, holiday food and drinks, lots of fun rides for the kids and of course, Santa, are part of the Tivoli Gardens experience from mid-November through December. This true Nordic Christmas experience includes snow-covered trees, real reindeer, numerous Christmas lights and beautifully decorated wooden houses. Tivoli Gardens is not the only Christmas market to explore in Copenhagen. Several others can be found throughout the city, including one at the renaissance Kronborg Castle and a Hans Christian Anderson fairy tale-themed market. In New York’s Finger Lakes region lies the real Bedford Falls, which was the inspiration for “It’s a Wonderful Life.” Seneca Falls knows how to ring in the season with its Christmas bells on. There is a four-day “It’s a Wonderful Life” Festival each December. The festival includes horse-drawn carriage rides, a Christmas tree lighting, gingerbread house, light displays, musical concerts and even visits with some of the original cast members! The movie is playing in town, of course, and there is a Bailey’s Park Vendor Village for finding that perfect gift. 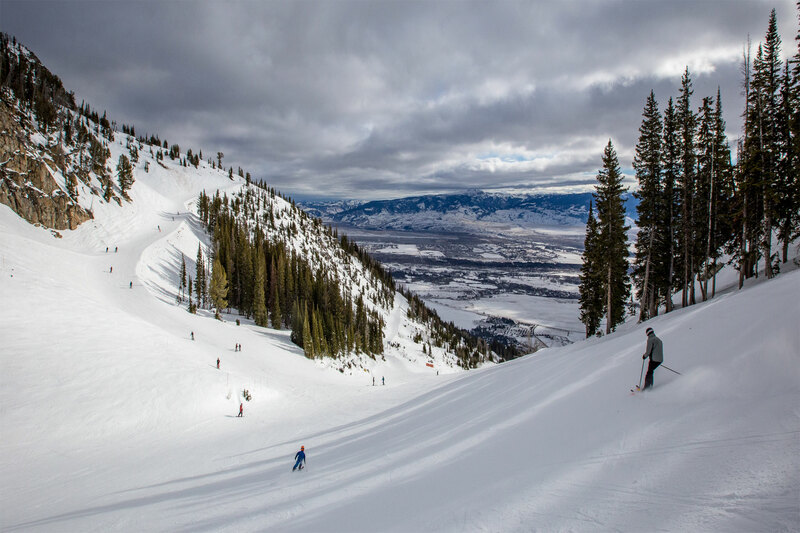 You will want to book this Christmas family vacation early because the crowds ascend on Jackson Hole during the holiday season! But for an almost guaranteed white Christmas (Jackson Hole averages 400 inches of snow a year), this is the spot. The slopes are open on Christmas Day, too, so if Santa happens to deliver a new board or set of skis, why not test them out immediately?! Snowmobiling, sledding, tubing, dog sledding and sleigh rides are a few of the other winter sports that await families at this Christmas vacation destination. The town square is decorated for the season and there are plenty of opportunities to drink hot chocolate and roast marshmallows or chestnuts over an open fire. Would there be any doubt that Disney knows how to do Christmas vacations? The Disney Christmas decor fully decks the halls at all the parks, complete with millions of lights, joyful music and even snow! 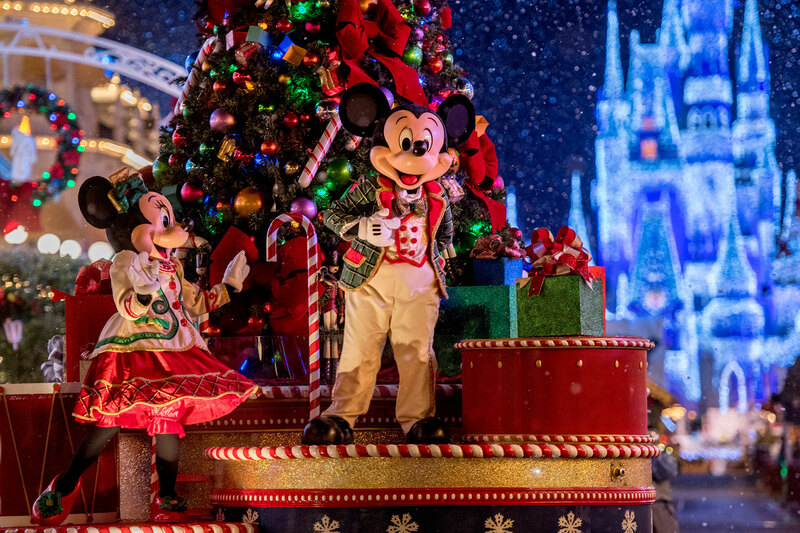 Your kids will love Mickey’s Very Merry Christmas Party, where the guy in the red suit and the giant mouse himself say hello, along with parades, light and fireworks shows. Even Cinderella’s Castle transforms into a “Frozen” ice palace! At Epcot, the family can learn how different cultures and countries celebrate the holidays, and it’s a full-on feast of a holiday dessert party at Disney’s Hollywood Studios Jingle Bell, Jingle BAM event. Expect to see large crowds at the parks around the Christmas season, when children have off from school. 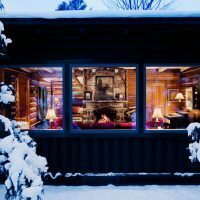 If it’s holiday music that warms your gingerbread house during the Christmas season, pack your favorite sheet music and head to Stowe, Vermont, for a stay at the Trapp Family Lodge. 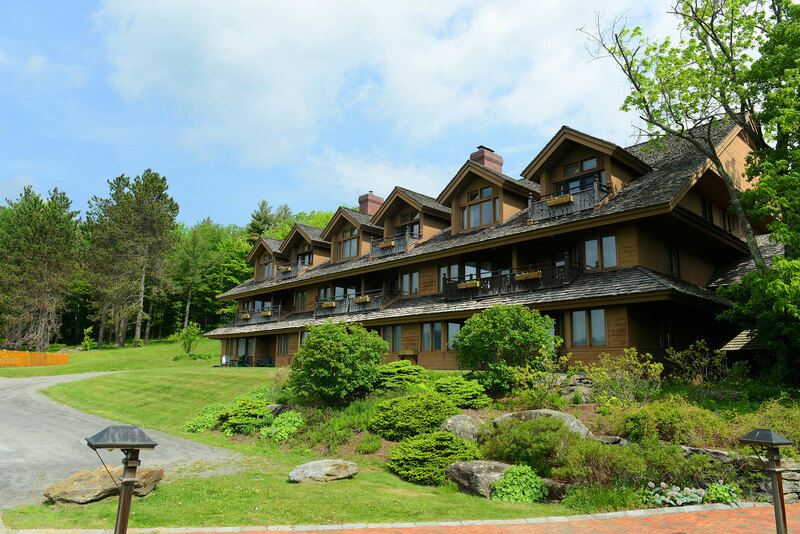 After leaving Austria and touring the United States as the Trapp Family Singers, the von Trapps eventually settled in Stowe and opened a lodge that you can visit for your Christmas family vacation. Throughout December, the lodge offers families a variety of festive activities like a holiday wreath workshop, sugar maple tours, cooking and baking classes, rocking climbing, and swimming. 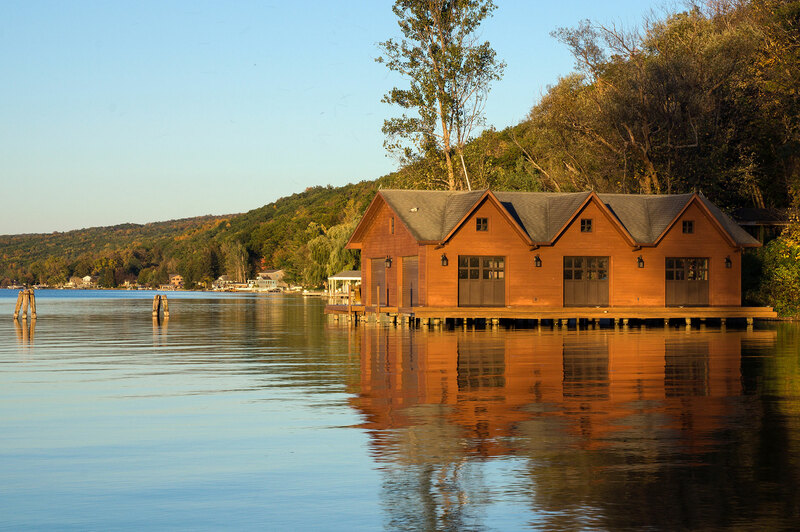 A classic movie, including “The Sound of Music,” of course, is shown nightly, and skiing is only 15 minutes away. But a few of your favorite things while staying at the lodge will be the Christmas Eve tradition of caroling with the von Trapps. The hills may actually come alive as your family belts out Christmas carols alongside the actual von Trapp family! Then Christmas Day, stay in your pajamas all day and enjoy a Christmas movie marathon at the lodge. Santa ditches his sleigh for an outrigger canoe in Hawaii! Elaborate sand sculptures are crafted instead of snowmen, and palm trees twinkle with lights. Christmas in Hawaii means beach days rather than snow-capped mountains. But all the traditions remain the same with caroling, tree trimming, hot cocoa and cookies. 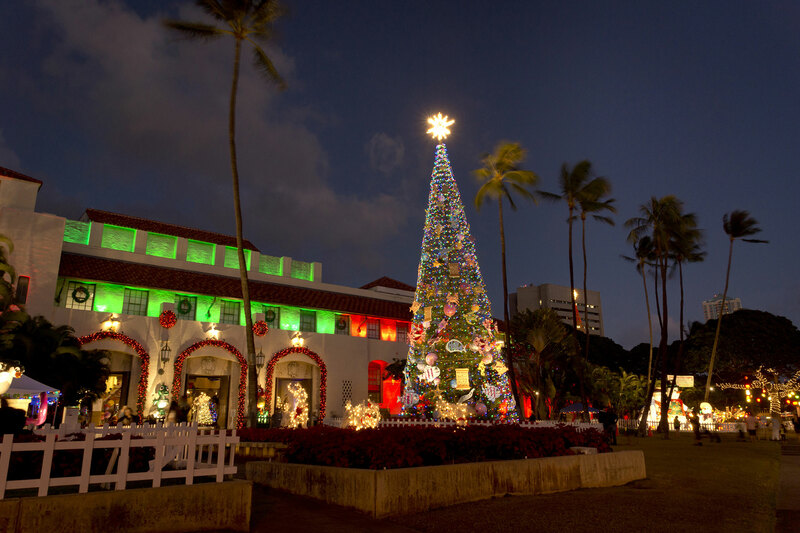 Don’t worry if your Christmas wish is to play in the snow during your Christmas family vacation to Hawaii, because you will be able to find man-made snow and ice. Who wouldn’t want to ice skate outside in shorts and a T-shirt?! 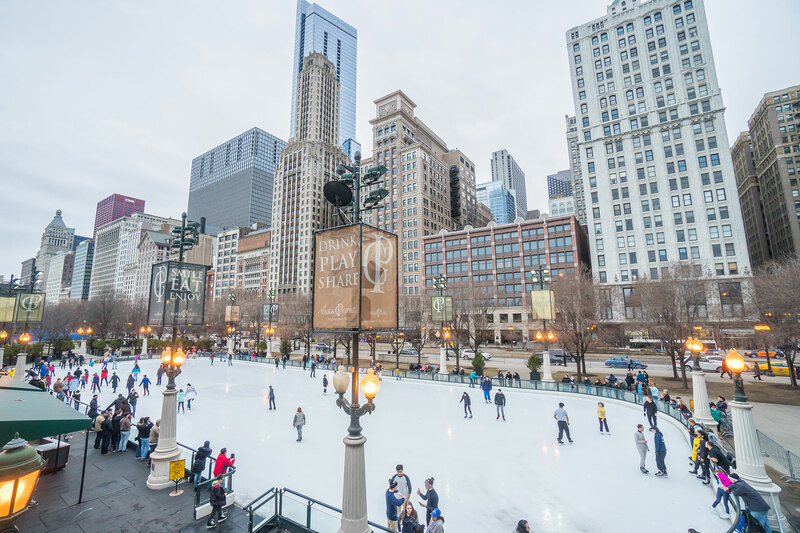 Chicago makes for a festive Christmas vacation, and stacks up nicely next to New York City. The giant Christmas tree lighting, parade and fireworks display lights up the start of the season as the parade marches down the Magnificent Mile the weekend before Thanksgiving. Families can enjoy the open-air Christkindlmarket, free ice skating at the outdoor rink at Millennium Park, indoor amusement rides at Winter WonderFest at Navy Pier, caroling in front of “The Beach,” and the Macy’s seasonal window displays. For a Canadian Christmas, visit Lake Louise in Banff National Park in the Canadian Rockies. Christmas on Lake Louise is the epitome of a family Christmas card. In fact, take your family holiday card photos during your Christmas vacation so you can mail it out next year! Families can ice skate on the lake and stop at the Ice Bar for some hot chocolate or wine and create a sugar pop treat out of hot maple syrup and snow. 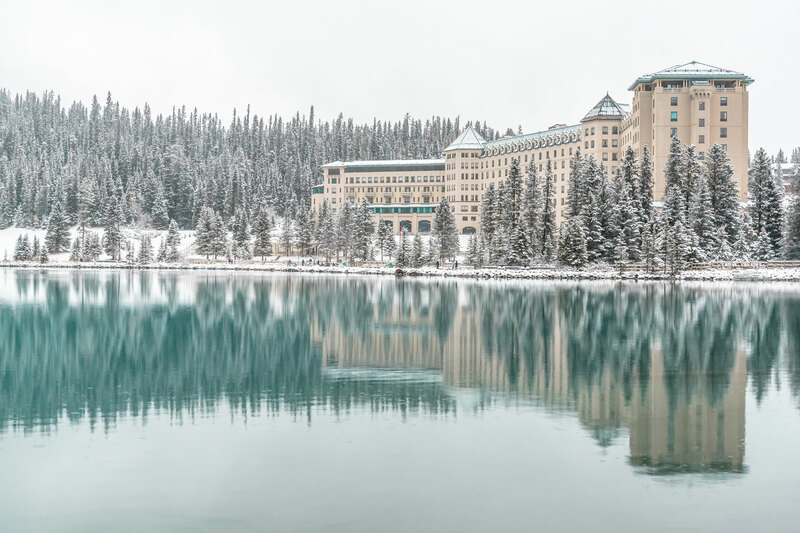 Snowshoeing, skiing, sleigh rides, all-day board game tournaments and evening gatherings around the campfire to roast marshmallows are only a few of the activities families can enjoy during a Christmas vacation to Lake Louise.